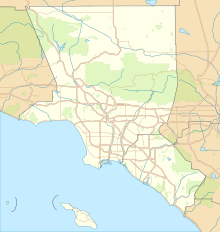 فرودگاه بین‌المللی لس آنجلس (به انگلیسی: Los Angeles International Airport) (یاتا: LAX، ایکائو: KLAX، موقعیت‌یاب اف‌آآ: LAX) فرودگاهی بین‌المللی در شهر لس‌آنجلس در ایالت کالیفرنیا است که بزرگ‌ترین و پررفت‌وآمدترین فرودگاه لس‌آنجلس بزرگ و ایالت کالیفرنیا، و یکی از مهم‌ترین فرودگاه‌های ایالات متحده آمریکا محسوب می‌شود. در سال ۲۰۱۵ میلادی، این فرودگاه ۷۴٬۹۳۶٬۲۵۶ تن مسافر را جابه‌جا کرد که نسبت به سال گذشته ۶٪ افزایش داشت، و سبب شد تا در ردهٔ هفتم فرودگاه‌های پررفت‌وآمد جهان بر پایه شمار مسافر قرار گیرد؛ همچنین در فهرست پررفت‌وآمدترین فرودگاه‌های جهان بر پایه تعداد پروازها، فرودگاه بین‌المللی لس آنجلس در ردهٔ سوم قرار دارد. فرودگاه بین‌المللی لس آنجلس قطب شرکت‌های یونایتد ایرلاینز، دلتا ایرلاینز، امریکن ایرلاینز، آلاسکا ایرلاینز، و ویرجین آمریکا است و نقش شهر کانونی برای الیجنت ایر، ایر نیوزیلند، کانتاس، ساوت‌وست ایرلاینز، Spirit Airlines و Volaris را ایفا می‌کند. از فرودگاه بین‌المللی لس‌آنجلس به ۱۰۱ مقصد داخلی و ۸۵ مقصد بین‌المللی در آمریکای شمالی، آمریکای جنوبی، اروپا، خاورمیانه، آفریقا، آسیا و اقیانوسیه، پرواز مستقیم انجام می‌شود. شرکت‌های هواپیمایی امریکن ایرلاینز و امریکن ایگل بیش‌ترین تعداد پروازهای خروجی از این فرودگاه را دارند و پس از آن‌ها یونایتد ایرلاینز، یونایتد اکسپرس و ساوت‌وست ایرلاینز. ↑ ۱٫۰ ۱٫۱ "Company Facts - Alaska Airlines". Alaska Airlines. ↑ ۲٫۰ ۲٫۱ "Delta Hub Station Los Angeles". January 12, 2016. Retrieved January 12, 2016. 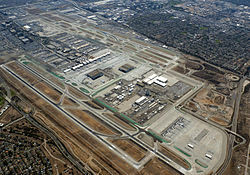 ↑ ۳٫۰ ۳٫۱ "Los Angeles International airport – Economic and social impacts". Ecquants. Retrieved September 7, 2013. ↑ FAA Airport Master Record for LAX (* A&fn=LAX Form 5010 PDF). Retrieved March 15, 2007. ↑ "LAX Statistics - Passengers". Lawa.org. ↑ Daily Breeze (January 26, 2016). "LAX sets record for passenger volume in 2015". dailybreeze.com. ↑ "Airport Traffic Reports". Airports Council International – North America. Retrieved August 19, 2012. ↑ "Aer Lingus Launching Dublin To Los Angeles Flight". boardingarea.com. October 21, 2015. Retrieved March 8, 2017. ↑ "Delta and Aeromexico expand options for U.S. -Mexico travel". Delta Air Lines. May 2017. Retrieved May 24, 2017. ↑ ۱۱٫۰ ۱۱٫۱ خطای یادکرد: خطای یادکرد:برچسب <ref>‎ غیرمجاز؛ متنی برای یادکردهای با نام amnewus وارد نشده‌است. (صفحهٔ راهنما را مطالعه کنید.). ↑ "Air China re-schedules Shenzhen – Los Angeles launch to Dec 2017". routesonline. Retrieved 10 August 2017. ↑ "Flights from Los Angeles to Baltimore- Alaska Airlines". alaskaair.com. Retrieved March 8, 2017. ↑ ۱۴٫۰ ۱۴٫۱ "Alaska Airlines receives U.S. DOT approval to begin Mexico City flying from San Francisco, Los Angeles and San Diego". May 2017. Retrieved May 19, 2017. ↑ George Avalos (2017-03-09). "Alaska Airlines plots new San Jose, San Francisco routes". Mercurynews.com. Retrieved 2017-07-27. ↑ "Alitalia extends Los Angeles to year-round service in W17". Routesonline. Retrieved 2017-07-27. ↑ "Allegiant Air to offer year-round LA flights | Business". themonitor.com. 2017-06-21. Retrieved 2017-07-27. ↑ "American Aug/Sep 2017 Auckland suspensions". routesonline. Retrieved 16 April 2017. ↑ "American adds Mainline Los Angeles – Vancouver service from May 2017". Routesonline. Retrieved 2017-07-27. ↑ "American adds seasonal LAX – Grand Junction route in S17". routesonline. Retrieved October 11, 2016. ↑ Staff Report (2017-07-18). "Inyokern Airport flights to begin Aug. 8 - News - Ridgecrest Daily Independent". Ridgecrest, CA. Retrieved 2017-07-27. ↑ "Delta adds Los Angeles - Mexico City route from Dec 2017". Retrieved 16 July 2017. ↑ "Delta adds Los Angeles – Albuquerque service from Oct 2017". Retrieved July 19, 2017. ↑ "Frontier Airlines cuts service from Cleveland to seven cities during fall, winter". cleveland.com. Retrieved March 8, 2017. ↑ "FRONTIER AIRLINES ADDS SERVICE IN 12 NEW MARKETS AROUND THE COUNTRY". Frontier Airlines. Retrieved 8 March 2017. ↑ ۳۰٫۰ ۳۰٫۱ "Hainan Airlines adds new Los Angeles routes from March 2017". Airline Routes. February 19, 2017. Retrieved February 19, 2017. ↑ "IAG takes flying to a new level". International Airlines Group. Retrieved March 17, 2017. ↑ Apr 4, 2017 Kurt Hofmann (2017-04-04). "LOT Polish Airlines launches Los Angeles services | Airports & Routes content from". ATWOnline. Retrieved 2017-07-27. ↑ "Norwegian Air to fly to Spain from four U.S. cities". usatoday.com. Retrieved March 8, 2017. ↑ "Norwegian launches Rome - US routes from Nov 2017". Routesonline. Retrieved 2017-07-27. ↑ "Sichuan adds Jinan – Los Angeles service from Dec 2016". routesonline. Retrieved 1 November 2016. ↑ ۳۸٫۰ ۳۸٫۱ ۳۸٫۲ Liu, Jim. "Southwest schedules new Los Angeles – Mexico routes from Dec 2016". routesonline. ↑ "Spirit Airlines expands to Pittsburgh, adds 7 new routes". Usatoday.com. 2017-02-22. Retrieved 2017-07-27. ↑ "United Airlines Announces Nonstop Service Between Los Angeles and Singapore - Jun 1, 2017". Newsroom.united.com. Retrieved 2017-07-27. ↑ "United adds Los Angeles - Singapore nonstop service from Oct 2017". Routesonline. Retrieved 2017-07-27. ↑ "United resumes Los Angeles – St. George route in Oct 2017". routesonline. July 2017. Retrieved 2017-07-27. ↑ "Xiamen Airlines opens Qingdao – Los Angeles bookings from Dec 2017". routesonline. Retrieved 19 June 2017. ↑ "Our Stations " AeroUnion". AeroUnion. Retrieved April 25, 2016. ↑ "News Content". Lawa.org. Retrieved April 25, 2016. ↑ "Air China Cargo Co. , Ltd". Air China Cargo. Retrieved April 25, 2016. ↑ ۵۰٫۰ ۵۰٫۱ "Aloha Air Cargo leasing an ABX Air freighter for LAX flights". ch-aviation. Retrieved April 25, 2016. ↑ "Welcome To Asiana Cargo". Asiana Cargo. ↑ "CARGOLUX AIRLINE Los Angeles CA, 90045 – Cortera Company Profile". Cortera. Retrieved April 25, 2016. ↑ "Cargolux Airlines International". Airport-LA. Retrieved April 25, 2016. ↑ "Network – Cathay Pacific Cargo". Cathay Pacific Cargo. Retrieved April 25, 2016. ↑ "Cathay Pacific expands cargo presence in the Americas with new freighter service to Portland". Cathay Pacific. ↑ "Centurion Cargo". Centurion Air Cargo. ↑ "China Airlines Cargo Services". China Airlines. Retrieved April 25, 2016. ↑ "China Airlines Service". China Airlines Cargo. ↑ "China Southern Airline Cargo". Citysearch. Retrieved April 25, 2016. ↑ "Cargo-China Southern Airlines Co. Ltd csair.com". China Southern Airlines. Retrieved April 25, 2016. ↑ "China Southern Cargo". Sky Team Cargo. Archived from the original on September 24, 2015. ↑ "Atlas Air Worldwide Holdings". Atlasair.com. 2015-09-18. Retrieved 2016-04-28. ↑ "Archived copy" (PDF). Archived from the original (PDF) on November 19, 2015. Retrieved November 19, 2015. ↑ "Polar Air Cargo". Polar Air Cargo. 2015-09-18. Retrieved 2016-04-28. ↑ "Polar Air Cargo". Polar Air Cargo. 2015-09-18. Archived from the original on April 26, 2016. Retrieved 2016-04-28. ↑ "Polar Air Cargo" (PDF). Polaraircargo.com. 2015-09-18. Retrieved 2016-04-28. ↑ "Media". Emirates SkyCargo. Retrieved April 25, 2016. ↑ "A-Z Air Freighters Guide – Emirates SkyCargo (EK/UAE/176)". Azfreighters.com. Retrieved April 25, 2016. ↑ "EVA Air Cargo". Eva Air Cargo. Retrieved April 25, 2016. ↑ "Korean Air cargo LAX 6101 W Imperial Hwy Los Angeles, CA Airline Companies". MapQuest. 2015-09-18. Retrieved 2016-04-28. ↑ "▒▒ Korean Air Cargo - To be a respected leader in the world airline community ▒▒". Cargo.koreanair.com. 2015-09-18. Retrieved 2016-04-28. ↑ "LUFTHANSA CARGO AG Los Angeles CA, 90045 – Cortera Company Profile". Cortera. April 25, 2016. Retrieved April 25, 2016. ↑ "Archived copy". Archived from the original on November 19, 2015. Retrieved November 19, 2015. ↑ "NCA – Nippon Cargo Airlines – Contact Us". Nippon Cargo Airlines. Retrieved April 25, 2016. ↑ "NCA – Nippon Cargo Airlines – Flight Schedule". Nippon Cargo Airlines. Retrieved April 25, 2016. ↑ "Qantas: Los Angeles Freight Terminal: Restrictions" (PDF). Qantas.org. 2015-09-18. Retrieved 2016-04-28. ↑ "Archived copy". Archived from the original on March 2, 2015. Retrieved November 19, 2015. ↑ "Qatar Airways Cargo to launch service to Los Angeles". Air Logistics Group USA. July 6, 2013. Retrieved April 25, 2016. ↑ "Qatar Airways to launch freighter service to Los Angeles". joc.com. July 6, 2013. Retrieved April 25, 2016. ↑ "Singapore Airlines Cargo". Foursquare. July 6, 2013. Retrieved April 25, 2016. ↑ "Welcome to SIA Cargo - Worldwide Offices". Siacargo.com. 2015-09-18. Retrieved 2016-04-28. ↑ "Archived copy". Archived from the original on September 13, 2015. Retrieved November 19, 2015. ↑ "North Carolina's SkyLease Cargo applies for Hong Kong rights". ch-aviation. July 6, 2013. Retrieved April 25, 2016. این صفحه آخرین‌بار در ‏۲۶ ژوئن ۲۰۱۸ ساعت ‏۲۰:۲۱ ویرایش شده‌است.